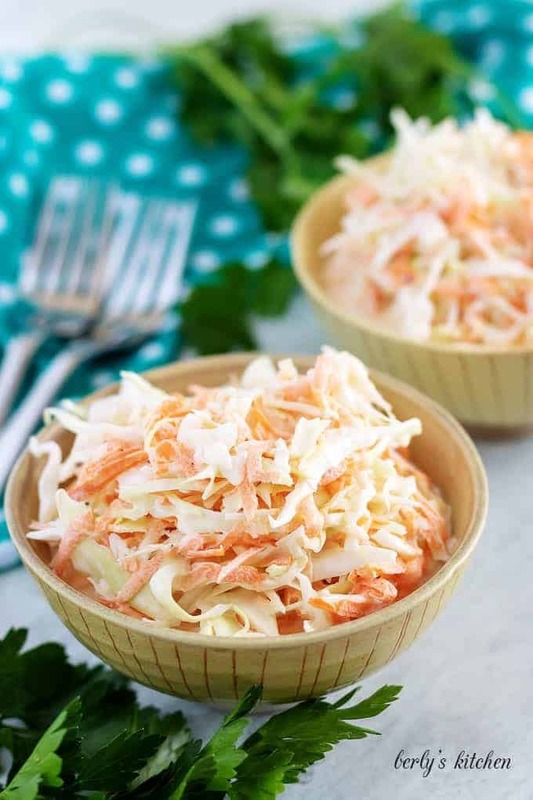 A traditional creamy coleslaw recipe that comes together in less than five minutes. 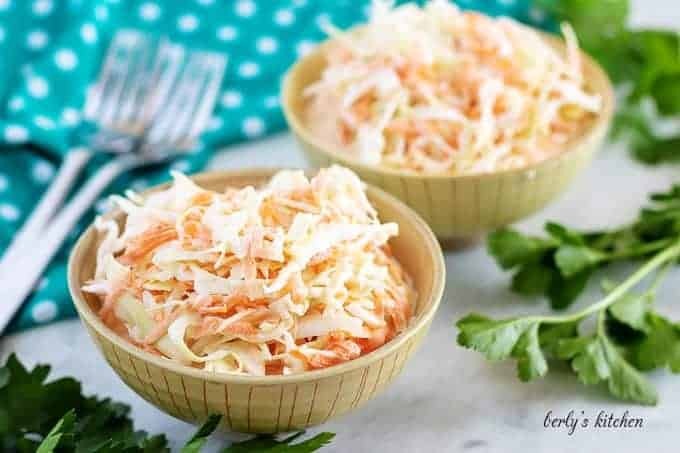 You won’t believe how easy it is to create this sweet, homemade slaw! Well, it was starting to feel like Spring here. Today, however, the weather is cool and rainy. Definitely not a, “go outside and fire up the grill.” sort of day. Regardless, I’m still in the mood for barbecue. 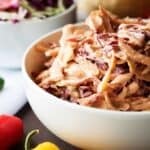 For days like today, a good slow cooker chicken recipe can go a long way in satisfying that urge for sweet, smoky BBQ. 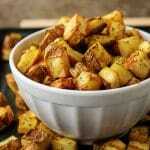 But, without a great side dish, your low and slow cooked meal will fall short of perfection. Fortunately, I have a traditional creamy coleslaw recipe to compliment my plans for a chicken dinner. Best of all, I can make it just before we’re ready to eat. Because, it only takes a few minutes to put together. Now that I have my meal planned, let’s get started! So, this one’s pretty darn easy. Usually, it takes less than five (5) minutes from start to finish. That includes dumping the cabbage and carrots into a bowl and whipping up the salad dressing or sauce. To start, open the bag(s) of coleslaw mix and put them into a bowl. You can shred your vegetables like we did, but it will result in a longer prep time and more dishes. Once the veggies are ready for your creamy coleslaw, it’s time to make the dressing. 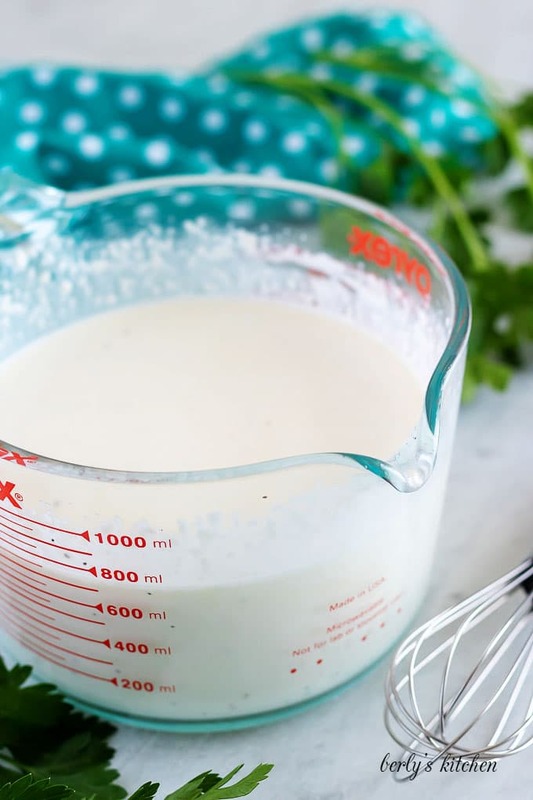 In medium mixing bowl or large measuring cup, whisk together the mayo, vinegar, sugar, and black pepper. Celery seeds are optional and thus, not listed in our recipe. When the dressing has been properly combined, pour it over your coleslaw mix. 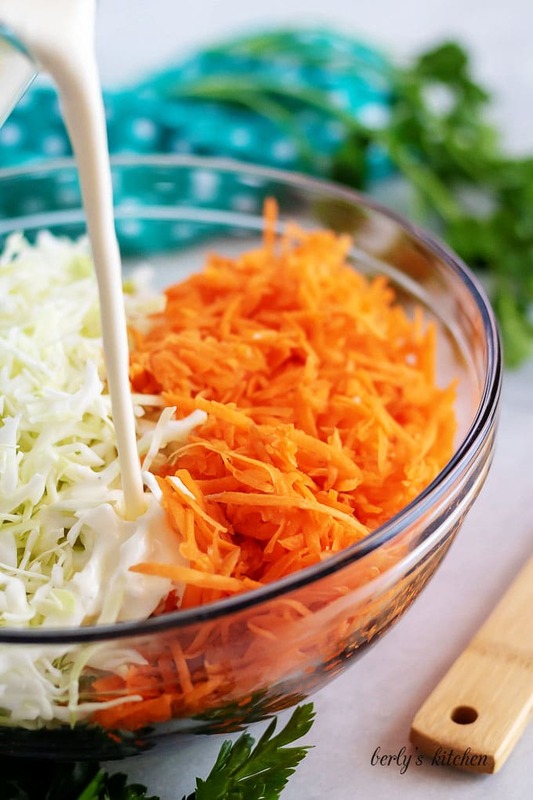 Use a wooden spoon or spatula to toss the cabbage and carrots in the dressing or sauce. That’s it, you traditional creamy coleslaw is done! Simply serve it and enjoy. Below the tips, I listed a few main dishes that you might want to serve along side your slaw. If you would like to reduce the sugar in our creamy coleslaw, feel free to try Stevia or another sugar substitute. On the other hand, you may want to take a natural approach. Honey works great in coleslaw recipes. In fact, one my favorite variations is a dressing made with mayo, honey, apple cider vinegar, and black pepper. It’s so tasty! One of the biggest tips I can give anyone, when making a vinegar based dressing, is to use sealed containers for mixing. In other words, put the ingredients into a mason jar (or other sealed container) and simply shake the jar to blend everything. Vinaigrettes, can and will, separate if not properly blended. Do yourself a favor and buy a mason jar for creating dressings. How long does coleslaw last? Typically, I use industry standards for personal food storage; three (3) days. However, since this recipe has vinegar in it, a known natural preservative, I would add one (1) to two (2) extra days of hold time. But, nothing works better than your nose. Smell it, if it’s questionable (acidic, soured), don’t eat it! 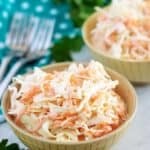 Need something to pair with your Coleslaw? If you enjoyed our traditional creamy coleslaw recipe, please leave us a comment and rate the recipe card. You can also find us on Facebook, Pinterest, Twitter, and Instagram by searching for Berly’s Kitchen! 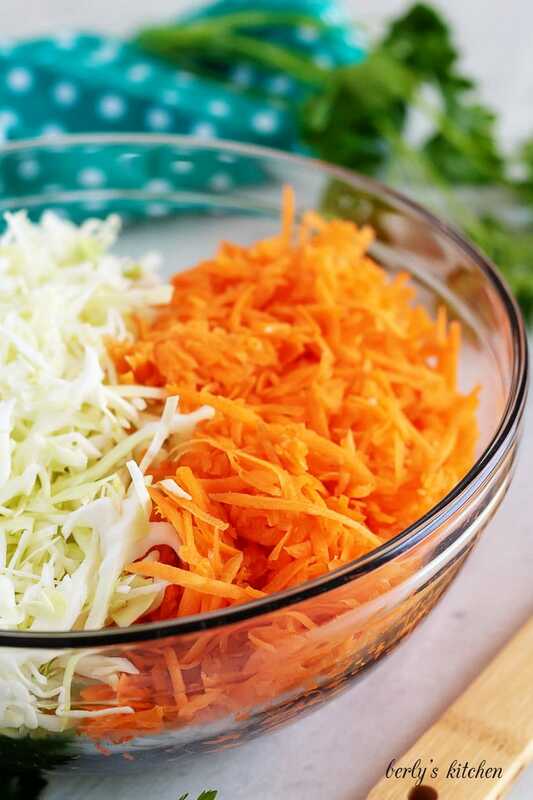 First, in a large mixing bowl combine the cabbage and carrots. Next, in a medium mixing bowl whisk together the mayo, vinegar, sugar, and pepper. Then, pour the coleslaw dressing over the cabbage and carrots. Last, stir the coleslaw to combine all the ingredients and serve. The calories listed are an approximation based on the ingredients and a serving size of half (1/2) a cup of creamy salad. Actual calories will vary. 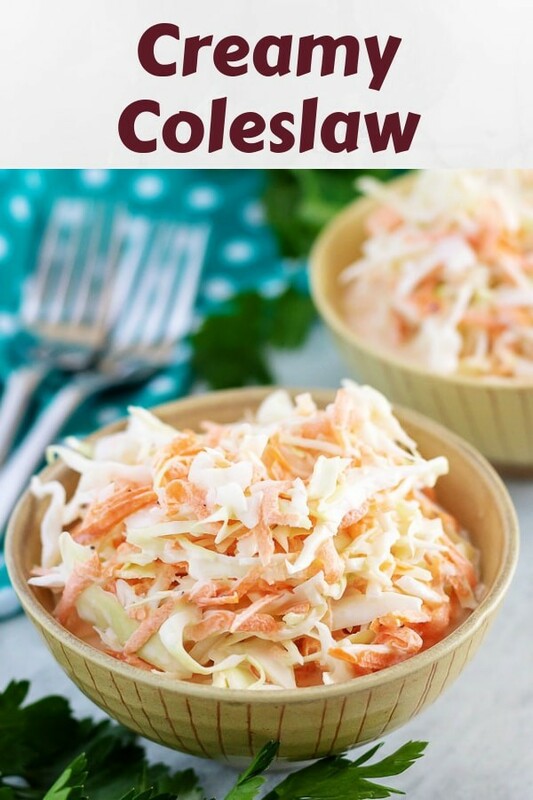 The coleslaw can be stored in your fridge, in a sealed container for up to four (4) days. I’m in the camp of buying a bag of coleslaw but my mother did it from scratch chopping the cabbage and carrots. Though I suppose when I was growing up there was no such thing as bagged salads! She also grated an apple into the coleslaw. I don’t usually do that. Not that I have a problem with apples. Just the extra step. In September I had coleslaw at a fish and chips restaurant in Oregon and I really regret not asking them what was in their coleslaw. It was really tangy. Reading your recipe, now I wonder if it was apple cider vinegar. Hmmm. I’m going to give that a shot next time. Thanks for suggesting it with your recipe! Well you can be sure the next time I’m in Coos Bay I won’t be shy about asking what’s in their coleslaw recipe! Thank you for commenting Cheryl! Sometimes, we buy bagged, it just depends. If I’m having a flare up and need stay off my feet, I get my veggies prepped at the store. If not, then I prefer doing everything myself. I’m a control freak and like things done a certain way lol! Apples are pretty tasty, but it’s easier to use apple cider vinegar. I hope you try it sometime, we like it. It sounds like that place in Oregon had some tasty slaw. There’s no telling for sure which vinegar they used, there’s so many options out there and I love most of them. I’ll take a look at the restaurants in Coos Bay. From what I hear Oregon has an awesome culinary scene. Wouldn’t mind visiting one day. Well, I have a post to write, so I should get to it. Thanks again for commenting, have a lovely day, Cheryl!